This DEMO is limited to 1 hour of functionality. The Octopus Multiplexer is a professional Multi-Program Transport Stream (MPTS) software multiplexer. Taking TS streams from video encoders as inputs, the Octopus Multiplexer combines them into MPTS at the output. 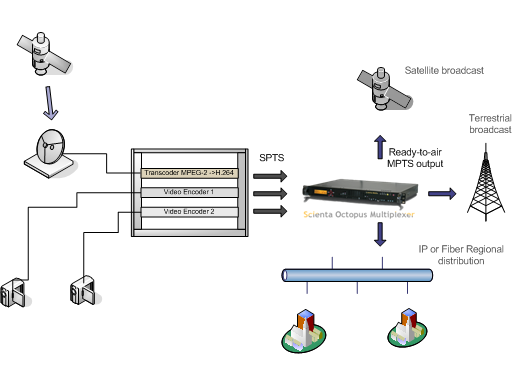 Input streams can be delivered by either IP or DVB-ASI interfaces. An MPTS stream can be supplied as an input as well, the multiplexer does not limit inputs to be an SPTS only. The Octopus Multiplexer is a software product built on top of the Scienta TS processing SDK. It utilizes a highly multiplexing intellectual algorithm to achieve maximum TS processing performance. Thanks to that, Octopus Multiplexer has very low system requirements: to serve a terrestrial broadcast, Intel Atom N455 processor is sufficient! The Octopus Multiplexer provides SNMP API, as well as WEB UI client for ease of control. The multiplexer has a rich set of features for TS processing, PID/program control and output SI tables customization. For the full specification, please read the datasheet.